Millions of tweets and millions of state documents. Intimate oral histories and international radio addresses. Ancient pottery and yesterday’s memes. Historians have access to this immense store of online material for doing research, but what else can we do with it? In Spring 2018, graduate students in the Public and Digital History Seminar at UT Austin experimented with ways to make interesting archival materials available and useful to the public; to anyone with access to a computer. Over the Summer, Not Even Past will feature each of these individual projects. 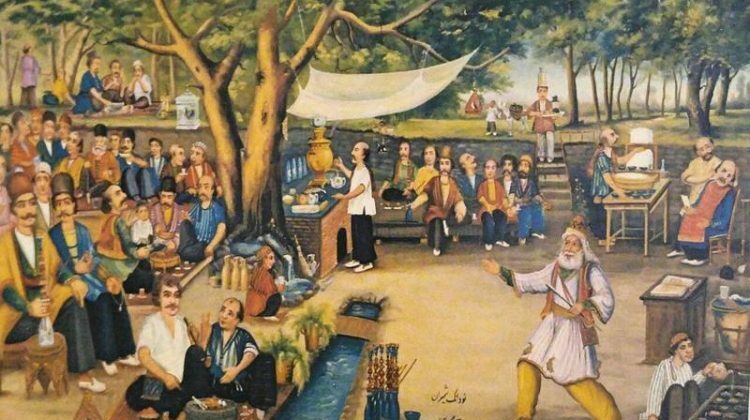 The coffeehouse, qahvehkhaneh, was an important political and cultural institution in Iran in the nineteenth and twentieth centuries. As men drank coffee, played backgammon, and discussed business, they also listened to impassioned pleas for democracy and reform from newspapers published in the Ottoman Empire, Russian Caucasus, and British India, smuggled into Iran and read aloud. Hoping to replicate the qahvehkhane’s spirit of sharing knowledge and camaraderie for anyone interested in Iran, Andrew Akhlaghi’s project comprises of digitized issues of Etella’at, an Iranian newspaper founded in Tehran in 1926. In addition to the newspaper collection, this site is also allows students of Persian to collaboratively translate articles. More on Akhlaghi’s project and The Public Archive here.